San Francisco, CA: The Golden Gate National Parks Conservancy presented its vision for the Presidio Exchange (PX) at Crissy Field to a packed house in the Presidio last night, Monday June 17, 2013, the first opportunity for public input and feedback on the best use of the former Commissary site (current home of Sports Basement) in the Golden Gate National Parks. The Parks Conservancy is one of the three finalists, along with the Chora Group/WRNS and George Lucas—selected by the Presidio Trust to submit ideas for a new cultural center at Crissy Field. Public interest in the project is high, as evidenced by the more than 300 people who attended yesterday’s forum, and the large number of participants who asked questions of the presenters. In making the case for the PX, Parks Conservancy President and CEO Greg Moore emphasized that the PX proposal is true and authentic to the spirit and history of the Presidio, and the one most closely aligned with the national park ethic of public ownership and engagement. The PX takes advantage of this park making opportunity by bringing a 21st Century cultural center to this landmark location – bringing the best of Bay Area culture to the best of Bay Area places. With a rich array of more than 30 program partners, the PX will bring the themes, culture, and creativity of the Presidio and Bay Area to life. At the core of the PX plan is the “World Stage,” a large, flexible venue space that will serve as an open platform for an ever-changing array of indoor and outdoor public programs, including art installations, concerts, performances, lectures, classes, workshops, conferences, and more. The plans also include interactive displays about the Presidio and other world heritage sites in a welcome foyer that will serve as a living room for visitors to Crissy Field and the Presidio. Additionally, the PX will offer food service, a “Crissy Courtyard” for outdoor programming, and potentially an elevated “Bridgeway” that would serve as an exciting connection to the new tunnel top parklands. 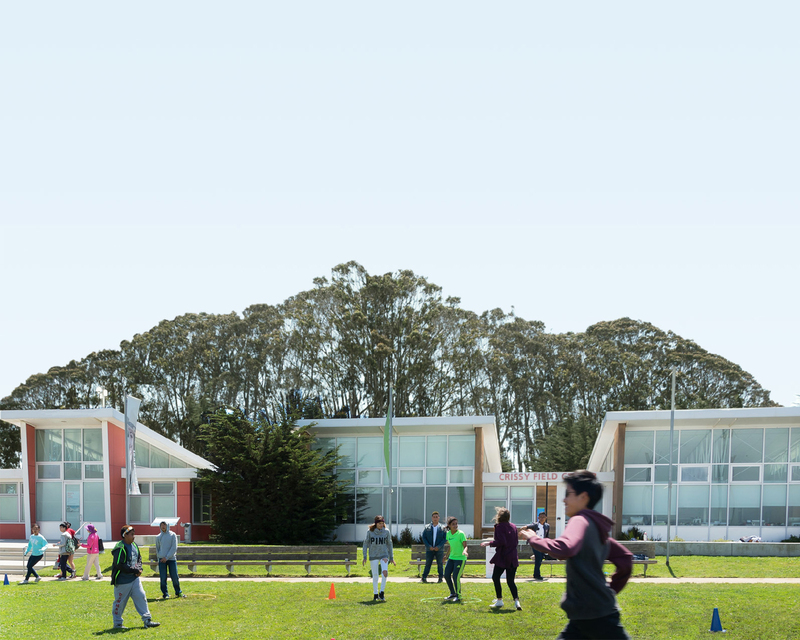 Fit seamlessly into the Crissy Field landscape, preserving world-class views and public access. Bring together people of all ages, backgrounds, and interests in a dynamic, welcoming space. Honor the history of the Presidio and the milestones and people who shaped it. Represent the interests of the greater community that created these spectacular public parklands in the first place. We took a look outside the Bay Area to places that invigorated former transportation corridors, historic buildings, neglected urban settings, and recycled buildings—much like we have here. Watch this video to get an idea of some exciting examples of what a 21st century cultural institution could look like. The Conservancy and its team of architects, designers and program partners bring extensive experience in large-scale, sustainable public projects, and will be seeking additional public input over the next few months before submitting the final PX proposal to the Presidio Trust in mid-September. The capital budget for the PX project is estimated at $50 million, with the majority of this funding coming from individual, corporate and foundation donors, a strategy consistent with the Conservancy’s many park accomplishments over the years. For more than three decades, the Parks Conservancy has been the nonprofit steward of the Golden Gate National Parks and the driving force behind the renewal of Lands End, the revitalization of Fort Baker, the preservation of the Presidio, and most importantly—the original transformation of Crissy Field. To view the PX proposal, click here. To receive project updates and be notified of upcoming public meetings, sign up here.